Israeli military surveillance satellite. Ofeq-5 was said to be about 33% heavier than its predecessors. Reconnaissance, optical satellite built by IAI for Tsahal, Israel. Launched 2002-2010. Used OPSAT-2000 Bus. Status: Operational 2002. First Launch: 2002-05-28. Last Launch: 2010-06-22. Number: 4 . Gross mass: 300 kg (660 lb). Height: 2.30 m (7.50 ft). It was built by IAI/MBT for the Israeli Space Agency and carried an imaging reconnaissance camera. The Ofeq-5 telescope/camera was produced by El-Op Electro-Optic Industries, a subsidiary of Elbit Systems. 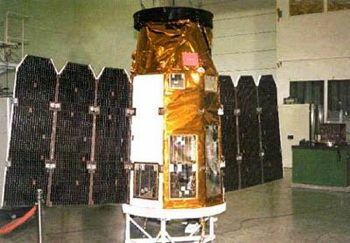 The system - which acquired images underneath and lateral to the satellite and in swaths ahead of its trajectory - was bigger than that installed on the Ofeq-3 and could produce images with 0.8 meter resolution. The Ofeq-5 had a design life of four years. EROS B Earth Observing satellite built by IAI for ImageSat International, Israel. Launched 2006. Used OPSAT-2000 Bus. Family: Military surveillance sat, Surveillance. Country: Israel. Launch Vehicles: Minuteman 3, Shaviyt, Shaviyt 1. Projects: Ofeq. Launch Sites: Palmachim. Agency: ISA, IAI, MBT. Bibliography: 2, 4, 552, 554, 6747, 12903. 2002 May 28 - . 15:25 GMT - . Launch Site: Palmachim. LV Family: Jericho. Launch Vehicle: Shaviyt 1. Ofeq-5 - . Mass: 300 kg (660 lb). Nation: Israel. Agency: Tsahal. Manufacturer: IAI. Program: Ofeq. Class: Surveillance. Type: Military surveillance satellite. Spacecraft: Ofeq 5. USAF Sat Cat: 27434 . COSPAR: 2002-025A. Apogee: 757 km (470 mi). Perigee: 370 km (220 mi). Inclination: 143.50 deg. Period: 95.90 min. Military Observation satellite. Return to flight of the Shavit booster following a lauanch failure. Launch delayed from third quarter 2001. The three-stage Shavit rocket took off from Palmachim Air Force Base on the Israeli coast and flew westward to put the satellite in a retrograde orbit. The AUS-51 third stage solid motor entered a 262 x 774 km x 143.5 deg orbit and separated from the Ofeq satellite. Both coasted up to apogee at around 1620 UTC when Ofeq made a burn to increase its velocity by 33 m/s, raising the orbit to 369 x 771 km x 143.5 deg. 2004 September 6 - . Launch Site: Palmachim. LV Family: Jericho. Launch Vehicle: Shaviyt 1. FAILURE: Third stage orientation failure at 270 seconds into the flight. Failed Stage: 3. Ofeq-6 - . Mass: 300 kg (660 lb). Nation: Israel. Agency: Tsahal. Manufacturer: IAI. Program: Ofeq. Class: Surveillance. Type: Military surveillance satellite. Spacecraft: Ofeq 5. Military observation satellite failed to reach orbit. Finanical loss estimated by Israeli press as $ 100 million..
2007 June 10 - . 23:40 GMT - . Launch Site: Palmachim. LV Family: Jericho. Launch Vehicle: Shaviyt 1. Ofeq-7 - . Mass: 300 kg (660 lb). Nation: Israel. Agency: Tsahal. Manufacturer: IAI. Program: Ofeq. Class: Surveillance. Type: Military surveillance satellite. Spacecraft: Ofeq 5. USAF Sat Cat: 31601 . COSPAR: 2007-025A. Apogee: 576 km (357 mi). Perigee: 340 km (210 mi). Inclination: 141.80 deg. Period: 93.80 min. Israeli optical reconnaisance satellite, evidently using an improved version of the Shavit booster and probably heavier and more capable than its predecessors..
2010 June 22 - . 19:00 GMT - . Launch Site: Palmachim. LV Family: Jericho. Launch Vehicle: Shaviyt 1. Ofeq 9 - . Mass: 189 kg (416 lb). Nation: Israel. Agency: ISA. Program: Ofeq. Class: Surveillance. Type: Military surveillance satellite. Spacecraft: Ofeq 5. USAF Sat Cat: 36608 . COSPAR: 2010-031A. Apogee: 586 km (364 mi). Perigee: 400 km (240 mi). Inclination: 141.80 deg. Period: 94.50 min. Israeli optical surveillance satellite..
2015 October 21 - . 12:45 GMT - . Launch Site: Vandenberg. Launch Complex: Ofeq 5. Launch Pad: LF04. LV Family: Minuteman. Launch Vehicle: Minuteman 3. GT216GM RV - . Nation: USA. Apogee: 1,300 km (800 mi). Training mission. Impacted Kwajalein..